Gabriel Johnson — Laguna Beach Live! Gabriel Johnson originally from Salinas, California, attended Boston’s prestigious New England Conservatory of Music. While there he studied under the tutelage of jazz greats Steve Lacy, Danilo Perez, George Garzone, John McNeil and Bob Moses. However, his greatest musical influence was his grandmother who always preached to him the importance of the arts and, most importantly, jazz. After completing his education in Boston, Gabriel decided to return to his California roots where he has been very active in the studio scene. 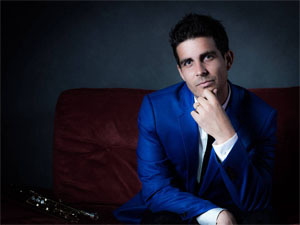 Gabriel has played or recorded with a wide variety of musicians and bands, including Blood Sweat and Tears, Gladys Knight, Steven Tyler, Leann Rimes, Trombone Shorty, David Foster, Jill Scott, Diddy, Skylar Grey, Faith Evans, Gerald Albright, Dave Koz, Johnny Mathis, Kyle Eastwood, Vince Gill, Andrea Bocelli, Chris Botti, Mindi Abair, Paula Cole, Lyle Lovett, Keb Mo, M83, B.o.B. and Burt Bacharach.